Promoting fun, healthy lifestyles in the fight against cancer. RUNNING TO HELP THE WORLD WIN THE RACE AGAINST CANCER. RACE Cancer Foundation fights cancer through action and prevention. ACTION: Our running events promote health and wellness in the community, reducing the risk of cancer while raising funds and awareness for organizations dedicated to fighting cancer. PREVENTION: Our programs create opportunities to reduce and detect cancer through education, prevention, and screening measures. Our Sunscreen Squad fights skin cancer by bringing free sunscreen dispensers to outdoor events across New England. In early 2008 , our founder was inspired to honor Rosemary, a friend’s mother battling Non-Hodgkin’s Lymphoma. 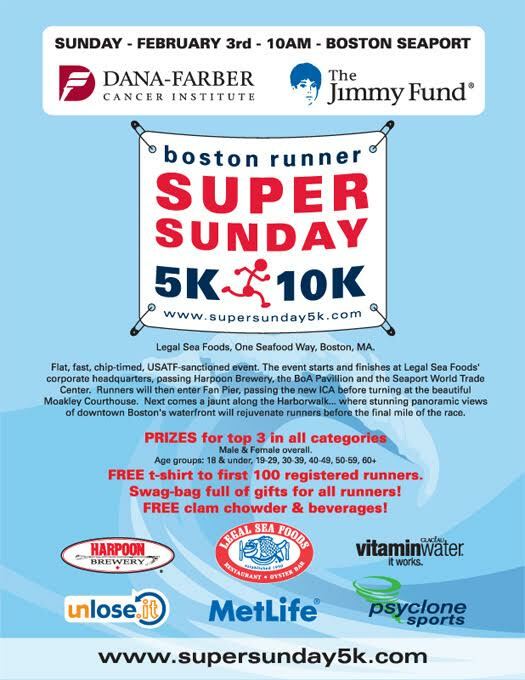 He organized Super Sunday, a running race which raised thousands of dollars for Dana-Farber Cancer Institute. Sadly, Rosemary passed away at Dana-Farber six weeks after the race. Having lost his own father to multiple myeloma eighteen years earlier, our founder was determined to fight back. With the help of his friends in Boston’s vibrant running community, Run Against Cancer Events (RACE) was born. What started as a 331 person race to honor Rosemary ten years ago has grown into one of New England’s most popular running events. 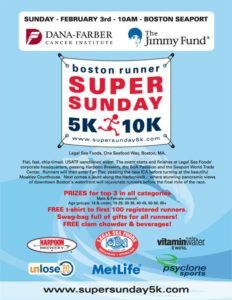 Super Sunday attracts thousands of weatherproof runners to Kendall Square each February. 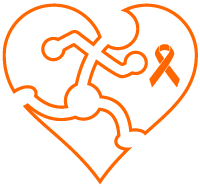 Now known as RACE Cancer Foundation, we produce several running races in Greater Boston with 100% of the funds raised going to charity. Our events have raised hundreds of thousands of dollars to fight cancer, benefiting organizations such as Leukemia & Lymphoma Society, Target Cancer Foundation, Livestrong Foundation, The Ellie Fund, Multiple Myeloma Research Foundation, and others. 100% of the funds raised from our events go to charity. Based in Boston, RACE is a Massachusetts non-profit organization and federally recognized as 501(c)(3) tax exempt public charity, EIN# 27-1859289. Donations and contributions are tax-deductible as allowed by law. If you would like to contact us or request a beneficiary grant application for your organization, please drop us a line via hello[at]racecancer.org.